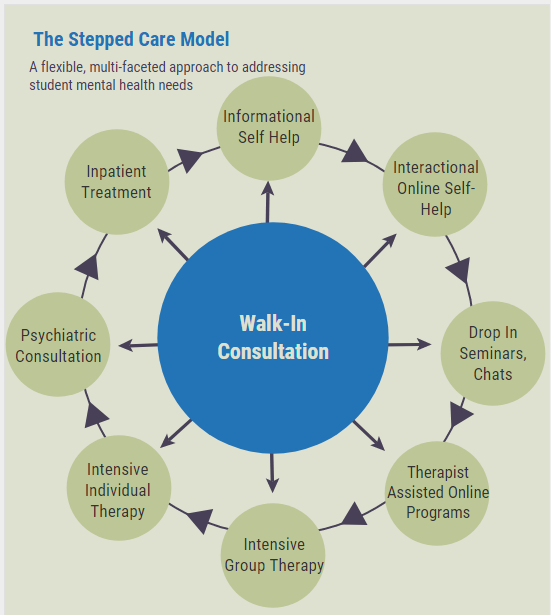 Our Stepped Care Model is designed to be personalized and relevant for each individual student. We offer a wide array of services that take into account the type of concern, research evidence on best practices, student personality and preferences, and readiness for making difficult changes or engaging in complex therapeutic processes. By taking a personalized, stepped care approach we hope to provide rapid and flexible access to wellness and mental health resources. This approach is aimed at empowering you to maximize and manage your own mental health to the best of your ability. To access counseling, come in to the Colonial Health Center, during business hours, and ask to speak with a counselor. No appointment is required. If you are in crisis, or concerned about a GW student in crisis, please call us 24 hours a day, seven days a week at 202-994-5300 (option 2). Counselors are available 24 hours a day, everyday to speak with you. We also encourage concerned GW students, faculty, staff, or family members to call when needed. On Campus: Call GWPD at 202-994-6111. Off Campus: Call 911, or go to the nearest emergency room.